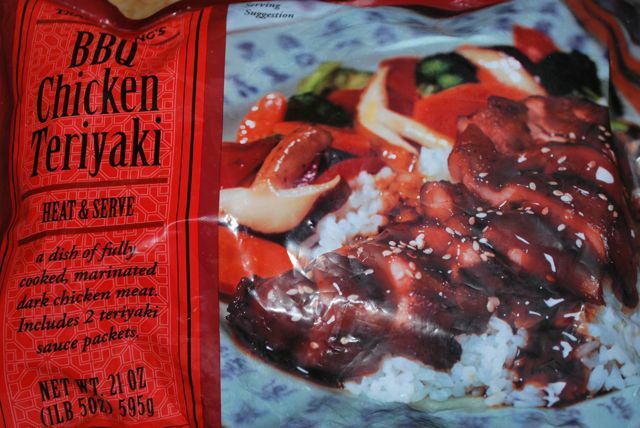 TRADER JOE’S FROZEN FOOD AISLE!!! I can spend minutes upon minutes in this aisle! So many options. The fish and meats section are divided in ready to make and make from scratch. Most of the stuff in this aisle is ready to make though. And when you’re feeling to lazy to make dinner, its GREAT to have any of these options in the freezer. I definitely stock up with these items when I go on the road for the hubs to enjoy. Better than fast food everyday while I’m out. I’m going to list a couple of the ones I’ve tried and the ones that are my FAVORITES! Just tried this one and it’s good, but when I’m in the mood for pho, it wouldn’t suffice my craving. This is a go to family favorite. My mother-in-law introduced us to this when we were home about a year and a half ago. For $4.99, it’s a cheaper alternative to Chinese delivery! It’s definitely a staple in our freezer. This is another staple. After we tried the Mandarin Orange Chicken, I purchased this. It’s much easier to prepare and I believe the same cost and just as delicious. To make it an all around balanced meal I add some frozen edamame or broccoli. I think I may have bought this sometime in the Spring. I’m not quite sure if it’s been at Trader Joe’s longer, but that’s when I snapped it up. Pretty good. Again, a cheaper alternative to Chinese take out. Definitely yummy! This sufficed my Thai soup craving; however, the serving size its a tad small. I think the serving size said 2, I’m guessing cups and not bowls. But if you wanted to serve to multiple people you would need to buy more packets. Otherwise known as risotto balls and OH-SO-DELICIOUS! They were sampling these one day and I liked them SO MUCH (but I’m a HUGE fan of risotto balls) that I picked them up. Such a good appetizer for an Italian dinner. I tried these after I saw them in the Trader Joe’s Fearless Flyer. I’m a huge fan of croissants but haven’t tried croissants that are multigrain If you’ve read my post about eating on the road, you know that I try to eat items that are packed with fiber for breakfast and this is one of those items. I know what you’re thinking “Multigrain? Doesn’t that mean it taste like cardboard?” NOPE. Tastes like regular croissant just wheat breadish. Other honorable mentions are their frozen mac and cheese (both guilt free and regular version) and grilled eggplant parmesan. I’m sure I’ve tried more but I can’t remember. Some items that I would like to try are the Indian and Mexican frozen meals, the marinated frozen fish, a couple of appetizers, pizzas, pastas, etc. Do you have any TJ favorites? If so, please share in the comments below. I totally agree! TJ’s is the best for quick, non-boring food. I actually had their frozen biryani rice and naan for dinner tonight 🙂 Also love their country potatoes and mushrooms and this eggplant-marinara frozen veggie mix (can’t remember the name). I’ve been interested in trying they’re Indian meals especially single they’re single serving portions (the hubs isn’t a fan of Indian). I’ll be sure to try those outs next time I’m at TJ’s. Thanks for the suggestions and thanks for stopping by. Come back soon.